Accepted Scientific Name: Mammillaria carnea Zucc. ex Pfeiff. Enum. Diagn. Cact. 19 1837 Pfeiff. 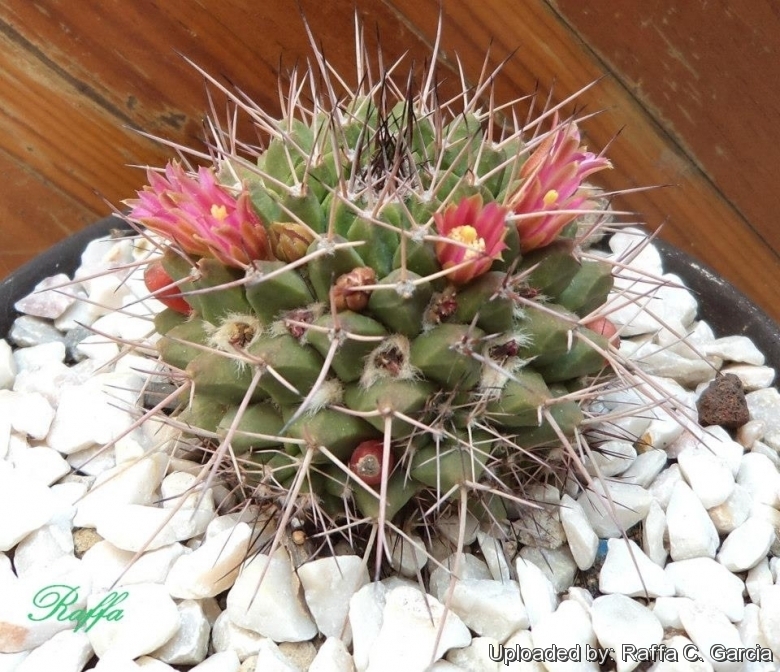 Origin and Habitat: Mammillaria carnea is widespread in central and southern Mexico (Guerrero, Oaxaca, Puebla).The species is abundant and has high-density populations. Type locality: Ixmiquilpan, Mexico. Habitat and Ecology: Mammillaria carnea grows on both plains and slopes usually in association with nurse plants. 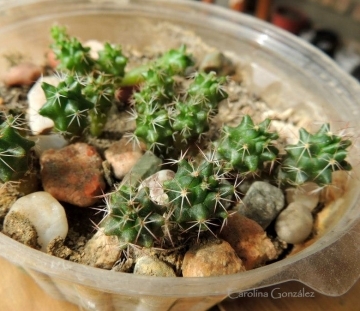 It occurs in tropical deciduous forest and xerophyllous scrub, cereus forest, tetechera, cardonal, mezquital, and in the margins of orchards usually interspersed with other succulents comprising: Echinocactus ingens, Myrtillocactus geometrizans, Pachycereus weberi, Neobuxbaumia tetetzo, Cephalocereus hoppenstedtii, Pachycereus hollianus, Stenocereus dumortieri, Stenocereus pruinosus, Escontria chiotilla, Pilosocereus chrysacanthus, Ferocactus recurvus, Ferocactus atrovirens, Ferocactus robustus, Echinocactus platyacanthus, Mammillaria schmollii, Mammillaria mystax, Mammillaria sphacelata, Mammillaria viperina, Coryphantha pallida, Coryphantha calipensis, Agave macroacantha, Agave marmorata, Plumeria rubra, Ipomoea arborescens, Bursera morelensis, Jatropha urens, Jatropha spathulata, Schomburgkia superbiens, Opuntia pubescens, Opuntia decumbens only to cite a few of the more common. The species is abundant, and although in many parts of its range the plains have been transformed into agricultural land and cattle ranching and some sub-populations are declining. The species is used as an ornamental. 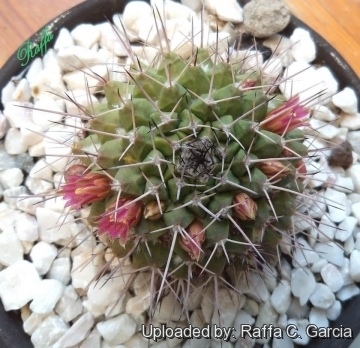 Description: Mammillaria carnea is a rather robust cactus species either solitary or clustering with age. The plant typically has 4-sided angular tubercles with yellow, woolly axils and only 4 radial spines. It will reward the skilled growers with ring of fine flesh-pink flowers circling the crown of the stem. Stem: Spherical, becoming elongated or cylindrical, thick, rounded at the top, bluish green or almost bronze colour, 8 to 9(-20) cm high, (6-)8-12 cm in diameter sprouting from the base when old. Tubercles: 4-angled, pyramidal, distinctly angled, firm, milky, their axils usually woolly, the upper ones erect, general colour clear green, waxy. 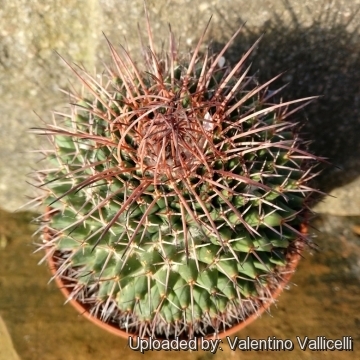 Spines: Mostly 4 (occasionally 5), straight to arching, rigid, reddish or pinkish brown with black tips, the lower one 8-20 mm long, twice as long as the other 3. Radial spines: Missing or reduced to bristles. Flowers: Funnelform, pale pink or pale rose, 15-20 mm long, 12-15 mm in diameter borne in the old axils circling the crown of the plant. Outer perianth-segments up to 2 cm long, nearly erect, flesh-colored. Fruit: Pear-shaped, obtuse, bright red. 1) Arias, S., Valverde, T., Zavala-Hurtado, A. & Hernández, C. 2013. 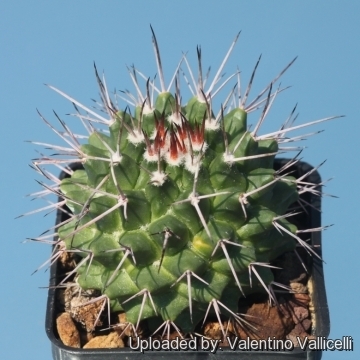 “Mammillaria carnea.” The IUCN Red List of Threatened Species. Version 2014.3. <www.iucnredlist.org>. Downloaded on 31 January 2015. 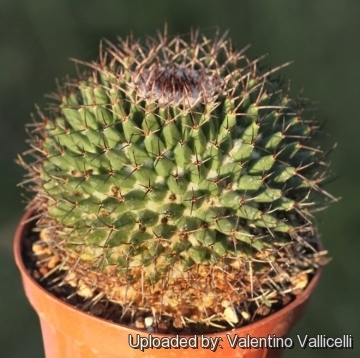 11) Hunt, D. “A new review of Mammillaria names.” British Cactus and Succulent Society. Oxford. 1987. 12) Říha, J. a Šubík, R. “Encyklopedie kaktusů.” Brázda. Praha. 1992. 14) CONABIO. “Catálogo taxonómico de especies de México.” 1. In Capital Nat. México. CONABIO, Mexico City. 2009. Cultivation and Propagation: Mammillaria carnea is a great looking cactus that offsets eventually forming wonderful clumps. From seed, it will fill a large pot in just a few years. Offsets are produced at the base, and are distributed somewhat randomly. Since the plant can make wide spreading mounds, shallow pots of large diameter will be required as the plant ages. It is not particularly difficult on own roots. No special cultural requirements.